The kitchen can be a fun place to work. The time spent creating new dishes, experimenting with baked goods, and making massive messes can't be taken away. You've made tons of memories in your kitchen, and eating gluten free shouldn't prevent you from making more. However, you need to be careful when cooking gluten free to avoid cross contamination. Whether you're an old pro or a gluten free beginner, you need to know how to stay safe in your kitchen. Here are 10 Ways to Prevent Cross-Contamination in Your Gluten Free Kitchen. Note: These cross-contamination prevention tips aren't just for our gluten free friends. If you cook or bake for a gluten free loved one, then you should know these tips for when you prepare their food. Even if you avoid the off-limit, gluten-filled ingredients, you may put your loved one in danger with your kitchen habits and contaminated equipment. This page is also useful for families that cook both gluten free foods and gluten-filled foods in the same space. These 10 tips will help you to stay safe and avoid cross-contamination. 1. Wood: Avoid wooden spoons or cutting boards that are also used to prepare gluten-filled foods. Metal and plastic are much safer options. 2. Toaster: Either use a separate toaster, or use toaster-safe bags to protect you from cross-contamination. Some Toaster-safe bags would be Toastabags or Vat19 ToastIt. 3. Grocery Store Bins: While at the grocery store, avoid unpackaged foods stored in bins. The scoops that are used may have been previously used on nearby gluten-filled foods. 4. Colanders: Colanders can easily have leftover gluten hiding without you knowing it. If it was used to drain gluten-filled pasta recently, then you need to clean the colander completely before using. It may be easier (and safer) to buy a dedicated gluten free colander. 5. 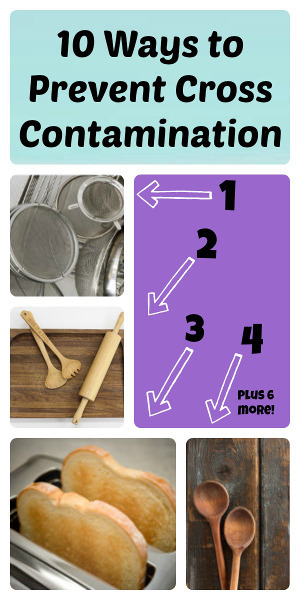 Flour Sifters: Oftentimes, it is difficult to fully clean flour sifters. You can either clean the sifter completely or, similar to the colander, you can buy a second sifter and ensure that it is only used for gluten free cooking and baking. Pasta is one of the trickiest dishes to make gluten free. But, these 12 Homemade Pasta Recipes will satisfy your gluten free needs. 6. Basting Brushes: Basting brushes should be cleaned sufficiently before use. The gluten can easily hide in the brissles of the brush. 7. Old Plastic: Avoid scratched-up plastic because it may have residual gluten in the grooves. 8. Grilling: When grilling, cover the grilling surface because there may be leftover gluten from previous uses. In order for the grill to eliminate residual gluten, it needs to reach 500 degrees Fahrenheit for 30 minutes or longer. 9. Condiments: Make sure you have squeezable condiments, such as peanut butter and jelly, so that you avoid the spread of gluten. For example, you wouldn't think that peanut butter has gluten in it, but if someone recently was spreading peanut butter on their sandwich then they may have contaminated the peanut butter without knowing. 10. Clean, Separate, and Label: Clean and separate everything. You should clean your counter tops before cooking. This will help prevent cross-contamination and it's a good habit to get into. You should separate your gluten free items from your gluten-filled items in your pantry and fridge. Finally, you should invest in a label maker and label your gluten free items, so that your family knows which food and kitchen equipment they should be using. Now that you understand how to be safe in your gluten free kitchen, you can easily make these 9 Homemade Bread Recipes. I think I will print this to post on the fridge for my family!